It’s been a week since I came back to Ohio after a week at PASS Summit in Seattle. I’m about 6 days late, but I wanted to take a moment to opine over the things I learned and offer some overdue updates and thanks. I had a fantastic time at the Washington State Conference Center. They do such a nice job there. The food is great. The facilities clean. I didn’t witness a single issue with A/V. There were so many volunteers you couldn’t possibly get lost. Thank you everyone behind the scenes that make this such a great event. I owe a special thanks to the 3 or 4 people from the PASS volunteer group and the WSCC that worked together to retrieve my lost jacket. Great job everyone! I’m excited to return next year for what might be the final PASS in Seattle as future years have yet to be announced. All of the excitement over SQL Server 2019, HDFS, Linux, containers, and Kubernetes serves as a reminder that I’ve chosen a career where one can never be complacent. The IT world 5 years from now will undoubtedly be unrecognizable to those who don’t embrace the future. I owe a thank you to my employer, Squire Patton Boggs, for encouraging me to learn and offering me the training and support needed to learn and grow as an IT professional. Thank you to everyone that came to my session on Encryption. I was afraid that being in a small room across the street in the final session of PASS that I would be talking to a small group of family and friends. Yet you filled that room. Everyone was so attentive and asked so many great questions. Thank you for making my first PASS Summit speaking experience such a great success. If you are waiting for me to post the slides and demos, they have been up this whole time. Click on Presentation Materials at the top right of this screen and you’ll see them at the bottom of the list. 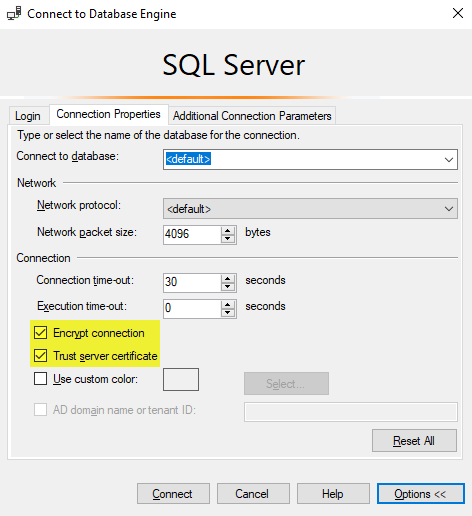 Also, at the end I promised I would post the connection string text to mimic the check boxes I was using in SSMS to encrypt my network connection to the SQL Server. Those 2 checkboxes can be replaced by adding these 2 elements to the connection string. certificate should not be needed if using a proper SSL certificate. Last, but most certainly not least, I owe a big thank you to Idera. During the event I was named a 2018-2019 Idera Ace. With this honor I’ll be able to attend a much larger number of SQL events than I would otherwise have been able to attend. 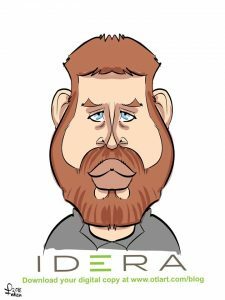 I am proud to partner with such a great company as Idera. I use a number of their products at my job every day and I couldn’t imagine trying to be a productive data professional without them. Congratulations to Idera for winning Habanero award for the Most Innovative booth at Summit where they were giving away awesome duck patterned socks and personalized caricatures to go along with the customary rubber ducks. I love my caricature!